There are many events Saturday in Florida, one in Georgia, and so far none in Alabama. You or your group can add an event through any of the above web pages. See also facebook and twitter. The end is peace and peace must be the path. 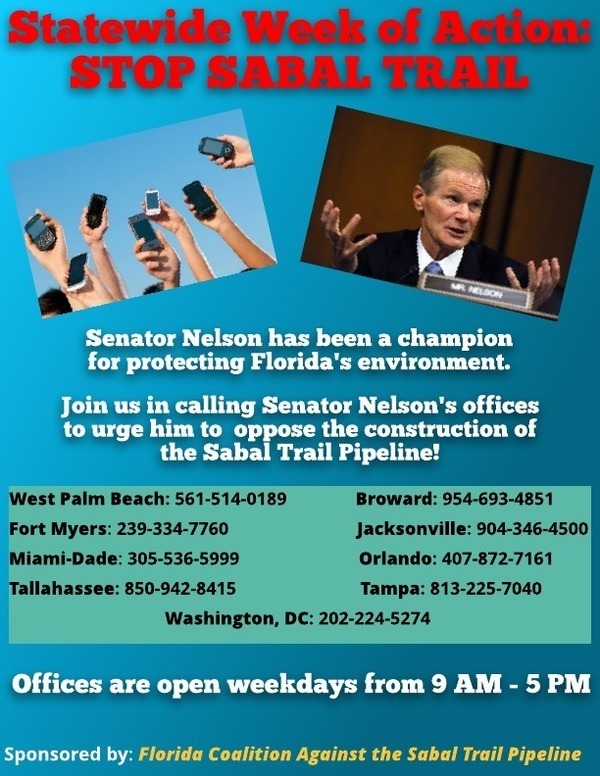 We must resist and oppose the Sabal Trail Pipeline, but not with violence. The means are the ends in the making. The end is peace and peace must be the path. I should point out that at this time it remains unclear whether the gunman near Dunnellon was intentionally firing at the pipeline or was a water protector. It’s also important to question the veracity of the initial reports, whether this man even discharged a firearm as alleged. All the water protectors I’ve met at the Sabal Trail Pipeline construction sites and water camps are completely committed to nonviolence. Here is our peaceful strategy to stop fracking, endless drilling, and endless construction of pipeline that threaten water, our most precious natural resource: Divestment from fossil fuels and pipeline companies and #BankExit from the banks that are funding them. Let’s invest in solar power and other renewable energy technologies, and socially responsible financial institutions like community banks and credit unions. These are constructive actions for all of us, and they are peaceful.